It's my favorite time of year! 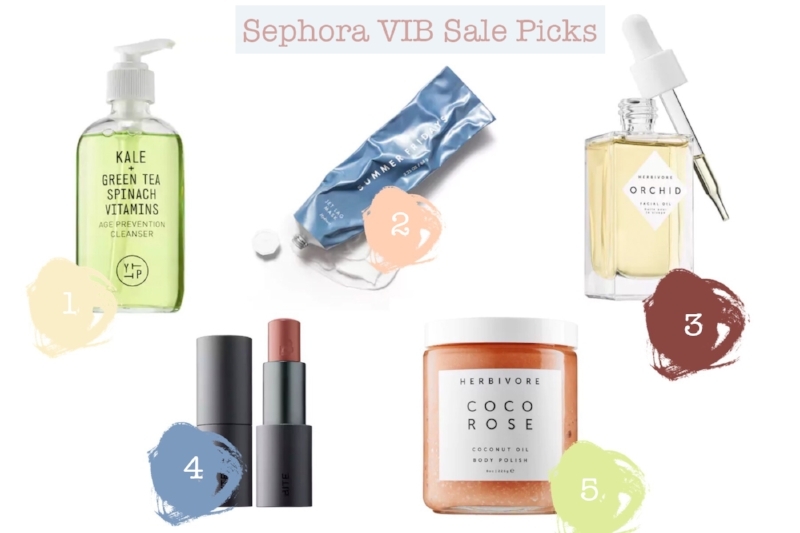 Twice a year Sephora holds a sale for their VIB members (anyone can sign up) where you get 15-20% off everything in the store and online. This is HUGE because a lot of items don't usually go on sale at Sephora, including some pricier skincare and fragrance. As you might know, I'm almost 100% cruelty free with my skincare, bath and body products. This sale will help me get one step closer! Since I've been posting a lot of makeup and skincare content on my instagram stories lately, I decided to put together a list of the things I'll be purchasing when the sale starts this Friday. It's important to remember that I literally save my money for these sales, so while it seems like I might be spending a lot, I've got it budgeted for. I try to limit the items I purchase to things I know I need to stock up on, and one or two new items that I've been wanting to try. I've got a post about my current cruelty-free skincare routine up, and this sale is the perfect time to stock up on some of the pricier items. I love planning for this sale and found a really good guide with some really helpful tips here. 1. Youth to the People Kale + Green Tea Spinach Vitamins Cleanser - I've posted about this cleanser for awhile and I LOVE it. After my last bottle ran out I couldn't justify buying it for full price, so I switched to a more budget friendly cleanser in the meantime. Here's what I love about this cleanser: gentle, non-stripping/drying, and it's vegan & cruelty free. It also comes in a glass bottle that is reusable, I repurchased my old one into a container for the mineral oil I use to cleanser with as well. 2. Summer Fridays Jet Lag Mask - Well, if I'd been a little smarter I would have waited for this sale to hit before purchasing, but after I started my new job I decided to treat myself with this product that I'd had on my wish list for the longest time. If it's not sold out for the sale I highly recommend purchasing. It's a moisturizing mask that works really well for my dry skin. I put it on overnight after I've cleansed and put on my serums, and then I wake up the next morning with dewy, plump skin. The morning after I used it I texted my roommate to say, "I'm a juicy girl!" and now that is also my official rap name. This product is vegan & cruelty free. 3. Heribivore Orchid Facial Oil - I've never tried anything from Herbivore before but a lot of their products have really good reviews. I've been looking for a good anti-aging serum for the day time and this light oil looks like it will be perfect for me. I tested out a sample a few weeks ago and I love the floral smell too. 4. Bite Multistick in Cashew - I recived a sample of this color in January and I've used it almost every single day. Despite my reluctance to use deeper colors on my lips for fear of turning into a grandma, I can't deny how good this shade looks with my hair color. I use a lighter pink color of this multistick for my blush and really love the creamy, blend-able formula. Plus it's cruelty free! 5. Herbivore Coco Rose Coconut Oil Body Polish - I've read some really great things about this scrub, and i'm a sucker for a good body polish in the tub, I always loves how smooth my skin is afterwards. Some people's skin doesn't react well to coconut oil, so avoid this one if the skin on your body is super sensitive. I've found that if I keep it away from my face I'm good to go. This product is vegan & cruelty free. What are you planning on purchasing for the sale? Anything good on your wishlist?